A lot of major works are in progress or about to be started on the Canal this winter, which is encouraging. The BCA’s report on winter stoppages gives the full picture, but in summary, they include: repairs to culverts (man-made channels under the canal), lining of leaking sections, lock structural repairs and gates replacement at various locations, towpath improvements and tree works. Note that closures to several sections of navigation and towpath will be necessary at various times during these works. The winter stoppage report will be updated as progress is made and if schedule changes become necessary. A 10lb mirror carp, found during the fish rescue near Monument bridge. This fish, along with many others were moved safely further downstream. “1.7km of Canal in the middle of Woking is currently being drained for the first time since restoration. Stop planks are installed at Skew Bridge and Monument Bridge, and the water is gradually being pumped out to enable a specialist licensed contractor to move the fish elsewhere on the Canal (of which so far there appears to be a healthy number of various species) – see right, and for more photos see the BCA Facebook page – Ed. The drain down is required so that Surrey County Council’s contractor can replace a life-expired brick culvert which passes under the Canal near Boundary Road Recreation Ground. Once the Canal is drained the contractor will excavate away the Canal bed, demolish the old culvert and replace it with a new pipe and cover back over with a concrete cap. They will take 4-6 weeks to do the work. As the water level dropped, the inevitable shopping trollies, bikes and traffic cones were exposed. Rangers and volunteers removed several trailer-loads of such stuff. 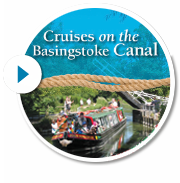 “Navigation through the Woking Pound is closed and there will be no lockages in or out of Woodham or St John’s locks for the duration of the closure to maintain water levels in the unconnected lengths of Canal either side of the drain down. The section of towpath between Monument Bridge and Boundary Road Recreation Ground will be closed from Monday 22 February and is officially closed to public access and will be secured as a construction site – stay out for your own safety! Fortunately there is an easy diversion along Boundary Road. The Ash Embankment in 1981, as restoration was progressing, but before the Aqueduct. Note the Basingstoke Canal railway, constructed to carry puddling clay. “Not wishing to have an easy life, a second drain down is in the advance stages of planning! Ash Embankment will be drained in two stages to enable (the same) contractor to re-line the bed of the Canal on both sides of the A331 aqueduct where there have been long term issues with seepage from the Canal bed. Surrey County Council is leading these works on behalf of both counties. Soft silt will be dredged from the channel and spread on the embankment, followed by lining the bed with a bentonite-based geotextile topped with clay won from the Canal bed and re-puddled. Fish rescue and the temporary relocation of marginal plants will be required before the excavations start in earnest. The bentonite liner is to be used due to logistical problems with getting enough clay to the site – unfortunately we no longer have access to the narrow gauge railway used during restoration! I would like to thank Canal & River Trust for their guidance on use of bentonite liners. “When the works on the Surrey side of the aqueduct are complete, this section will be refilled and the Hampshire section of the embankment (between the aqueduct and Ash Lock) will drained and the process of repairs repeated. James Taylor, Strategic Canal Manager. Phases of Ash Lock (E) to Eelmore bridge (W) towpath refurbishment. The towpath improvements referred to above are going on along a 4km stretch from Ash Lock to Eelmore Bridge, near the end of the Farnborough airfield. This is an example of where the Canal has benefitted as a result of the Aldershot Urban Extension development. The towpath is being closed and relaid in stages, working east to west, by a contractor working on behalf of Granger, the AUE developer. The new surface will eventually connect up with the 1.6km of towpath that the Society laid between Eelmore bridge and Norris bridge near Fleet in 2011/12.